This classic Passover dish of scrambled eggs and matzah can be sweet or savory. Matzah Brei, also spelled as matzo brei, is a classic Passover dish of scrambled eggs and matzah, often enjoyed on the morning after the Passover seder and throughout the holiday. It’s a tasty and filling dish for those keeping kosher for Passover, a time during which breads and bagels are verboten (the horror!). Everything from its ingredients to the way you make it is adaptable, which is why its precise definition can be so elusive. All matzah brei recipes are united by two ingredients–eggs and broken-up pieces of matzah–and one matzah-softening technique–soaking matzah pieces in hot water for 30 seconds and squeezing out the water. Everything else about the dish can differ, depending on where you’re from, or what you like to eat. For instance, matzah brei can be sweet or savory. If you grew up eating it sweet, with honey or cinnamon, your family’s recipe might come from Poland or Hungary. By contrast, German, Lithuanian, and Russian recipes are usually savory, with salt and pepper or even sauerkraut. Today’s variations take the sweet and savory classics up a notch with savory ingredients like onions and peppers, or if you’re going sweet, apples and maple syrup. The way you make it varies, too: It can be scrambled like eggs, flipped like pancakes, or fried like a Spanish tortilla that fills the pan. As for the name? Brei (rhymes with fry) is German for a mash, or semi-solid food. And here’s a fun fact: In modern Yiddish, brei means to fry. 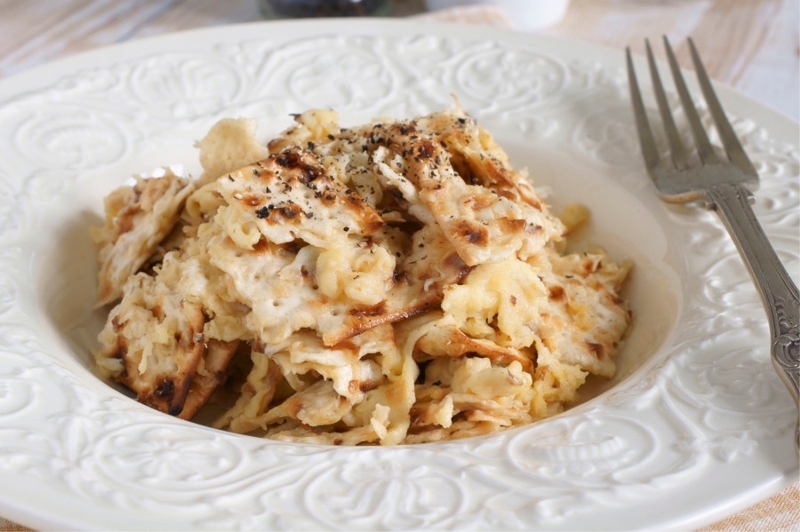 However you like it, Matzah Brei isn’t just for Passover; it’s a quick and easy dish that you can nosh on all year round, for breakfast, lunch or dinner!